Well! Now that the dust has settled, we have the faculties to write a proper thank-you note to those of you who actively supported our recent album release and tour. We give our thanks specifically to everyone who bought albums, attended shows, spread the word, graciously hosted us, and gave us advice about IT gizmos and marketing. Far-flung friends came to meet us, new fans gave us insights into how our music affects them, past audiences and album buyers returned, and long-standing friends showed us that they’re still by our side. In all your different ways, you keep us going. Our heartfelt thanks to you! We also thank the talented musicians with whom we shared shows: Rose & The Sea (Newcastle), Bleeding Gums Murphy (Sydney), Alana Patmore (Sydney), The Cheeky Violets (Canberra), Mixtape Chorus (Canberra) and The Old Married Couple (Melbourne). Let’s all do it again soon! Hello! Annie here. This weekend, December 18th-20th, we conclude our single tour, darting from Melbourne, to Canberra, to Euroa. On Friday, 7-9pm, we’re performing inside a vintage clothing shop! It’s Once More, With Feeling in Seddon, Melbourne. There’ll be champagne, tasty Christmas treats, discounts and giveaways. I was introduced to Jo, the store’s owner, whilst at Soul Scissors, our mutual hairdresser. We instantly sensed a collaborative opportunity, and this is the result. Jo wants to have a party to thank her customers for their support throughout the year, and we’d like to do the same. Everyone is welcome. At 7pm, The Cheeky Violets will bring their combination of indie, folk, pop and a touch of jazz. Each singing and playing acoustic guitar, the duo performs originals and covers by their favourite artists. At 7:30pm, we have Mixtape Chorus – A choir for lovers of indie pop music. Canberra’s finest shower singers meet weekly to sing choral arrangements of their favourite songs. In this rare performance, they’ll be sharing their indie-pop joy with all. Entry is $5 at the door. On Sunday, 2-5pm, we’ll teleport back to the grand, old Seven Creeks Hotel in Euroa. We’ll expend the last of our musical touring juice over 3 sets of originals and vintage pop covers. Entry is free. It’s less than 2 hours from Melbourne, and should be a relaxing country afternoon, and we’d love to have your company. This weekend Dec 11th and 12th, we travel north to Brisbane and The Gold Coast! On Friday, 7-10pm, we’re at Cardigan Bar in Sandgate, Brisbane. We’ll perform the 1st and 3rd set of this show, complementing our originals with 1960s pop hits. Our friend and special guest, Lisa Crawley, will perform the middle set. Lisa is currently touring her new 5-track EP Up In The Air, which builds on the retro vibe of her previous releases and showcases a singer-songwriter who has found her place in a dreamy, melodic pop world, with an edgy darkness. Entry is free. On Saturday afternoon, you’ll find us in Brisbane’s Queen Street Mall, outside Wintergarden. Hosted by City Sounds, we’ll perform three 30 minute sets of our originals at midday, 1pm and 2pm. Attendance is free. Stroll by and say hi! On Saturday night, we reunite with Lisa Crawley on the glorious Gold Coast. We’re performing amid the retro-chalet style decor of restaurant and bar, The Loft on Chevron Island. S.S. Sebastian opens the show at 8pm, followed by us, and then Lisa. In the lead up to Christmas, we continue our touring to Canberra, Euroa and back to Melbourne. You’ll find details on our Shows page. This weekend Dec 5th and 6th, we’re in Adelaide and McLaren Vale! On Saturday night, we perform at The Crown & Sceptre in Adelaide, joined by 2 local acts. Anthony Priwer writes 1960s style pop songs, which he sings with warm and heartfelt vocals, accompanying himself on ukulele. He opens the show at 9pm, followed by us at 10pm and The Sons Of MOD at 11pm. Entry is free. On Sunday, 12:30-3:30pm, we continue 40km south to McLaren Vale. In the relaxing surrounds of Red Poles gallery and restaurant, we perform 3 sets, complementing our originals with 50s and 60s pop songs. Again, entry is free. In the lead up to Christmas, we continue our touring to Brisbane, the Gold Coast, Canberra, Euroa and back to Melbourne. You’ll find details on our Shows page. Kay Proudlove’s live performance is much like being invited to her lounge room. Combining acoustic guitar with her jazz-nuanced folk singing style, she writes and performs with an engaging storytelling quality. Lennie Tranter & The Bagism Revelation perform melodic pop rock, inspired by the great British bands of the 60s, 70s and 90s. Their catchy sing-alongs with harmonies, guitars, bass, drums – the whole shebang – deliver a “rolling, great time,” as one (possibly over) enthusiastic audience member has put it. Set times are 7:15pm Annie & Bern / 8:15pm Kay Proudlove / 9:15pm Lennie Tranter & The Bagism Revelation. Entry is $5 at the door. We then go to Adelaide, McLaren Vale, Brisbane, the Gold Coast, Canberra, Euroa and back to Melbourne. You’ll find details on our Shows page. In the meantime, here’s the video for our single, Christmas With You. We really hammed it up but it also feels genuinely like us. It was created by our friends, Tim and Debbie, from concept to location scouting, storyboarding, set design, properties, set-up, direction, cinematography, lighting, continuity, catering and editing. Not only did they do all that – They also made the day’s shoot really fun and easy for us. Contact them at zombiebrainspace@gmail.com to discuss making videos with them. It was filmed at Guildford in Victoria, with the gracious hospitality of Sharon and Glen, using their vintage ‘Sharavan’ caravan. It’s a colourful depiction of a carefree, Australian, camping Christmas, complete with real flies! Alanna & Alicia Egan are twins who blend folk, jazz and roots in their original, acoustic songs. With sweet harmonies and fine songwriting, they have charmed audiences around Australia with their onstage warmth, wit and sense of fun. They’ll be joined by Damien Neil (guitar) and Silas Palmer (piano, violin and mandolin). Shadow Feet is NZ artist and musician, Ellen Sørensen. Interweaving visual narratives through piano melodies, likened to Agnes Obel and Regina Spektor, Shadow Feet speaks of familiar truths in foreign settings, from lonely beasts looking for hiding places in barren lands to princes found sleeping on forest floors. Set times are 7:30pm Shadow Feet / 8:30pm Alanna & Alicia / 9:30pm Annie & Bern. Entry is $5 at the door. This show is the first on our tour, which goes to Sydney, Adelaide, McLaren Vale, Brisbane, the Gold Coast, Canberra and Euroa in the lead up to Christmas. The full tour details are on our Shows page. It’d be lovely to see you! Hello! We’ve just released a Christmas single / Christmas card and we’re going on tour! 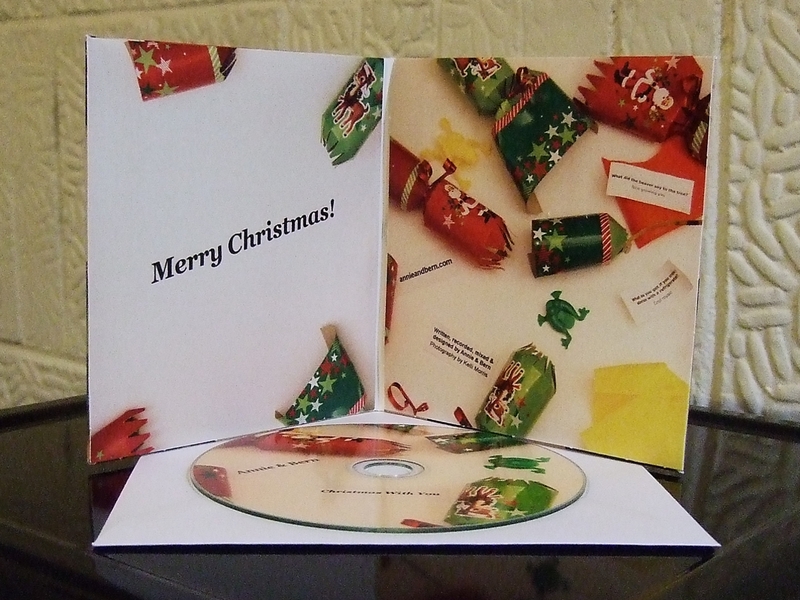 The CD’s colourful sleeve makes it a fab Christmas card and gift, with plenty of space to write greetings. A white envelope is included, for posting or for presentation as a gift. We’ll have it for sale at our gigs or to order from our online shop. You can also listen or download it here. Our tour starts on November 22nd, and goes to Melbourne, Sydney, Adelaide, McLaren Vale, Brisbane, the Gold Coast, Canberra and Euroa. We’ll post date and venue details in a future post, but you can also check them here now. We hope you like the song. It’d be fab if we can say hello in person at one of our gigs between now and Christmas! Hello. It’s Annie here, with an invitation: We’re performing at Maldon Folk Festival, Friday October 30th to Sunday November 1st, and we’d love to see you there! Around this time last year, we won the festival’s Roddy Read Memorial Songwriting Award. Along with the prize of a Cole Clark guitar, it secured us a spot at this year’s festival. We’re playing a set of our originals each day. We’re also debuting our new single and Bern is making his singing debut. This festival of folk offers music, workshops, dance, storytelling, poetry and comedy. You’ll taste Celtic, North American, Latin, Italian and Australian-bush flavours. You’ll see established artists and up-and-comers. A personal highlight last year was seeing MORRIS DANCERS! Watch this video to get a good sense of the friendliness and warmth of the festival…and spot the Morris dancers at 4’18”. They’ll be there with bells on! This Sunday June 14th brings what I expect will be our most fabulous gig to date. We’re performing at The Bobby Dazzler Market‘s British Invasion Special! It’s a party, in a market, in a pub! We’re on at 12 noon, followed by mod bands The Sons Of Mod and The Pollydevlins. There’ll be stalls packed with vintage clothing, vinyl records, accessories, furniture and art. There’ll be go-go dancers. There’ll be tarot readings. There’ll be food and drinks. There could well be scooters. There’ll be designers of vintage-style clothing AND there’s even a competition you can enter at the event page to have a dress or flares made especially for you! It’s at The Provincial Hotel in Fitzroy, 12noon-6pm. Entry is free. Come. This Friday May 29th, we’ll be returning to The Thornbury Local! We’ll perform 2 sets, 9:30-11pm. The kitchen is open 6pm-midnight, the drinks are impressive, and entry is free.